State and federal law says that corporations don’t need community permission to drop pesticides overhead, or to site a toxic dump next to the school grounds. So who does decide? State agencies issue corporations “permits” and state legislatures routinely “preempt” (usurp) community lawmaking authority on behalf of those corporations. When corporate executives decide to site an unwanted project in our communities, we are told we cannot say “no,” because that would be a violation of the corporation’s Constitutional rights. But we can change that. This program is providing a framework to transform grassroots organizing to protect people and planet. We’re community rights organizers. Led by Shannon Biggs, and focused primarily in California, we assist communities and community groups, like Mendocino County to pass new laws that place the rights of residents and ecosystems above corporate interests, and to ban unwanted activities, like fracking. We provide groups with training materials, education, media and organizing training, practical support and with our legal partners at CELDF, we help to write and pass rights-based legislation at the local (and state) level. We teach communities across the United States the rights-based framework of action through speaking events, one and two day rights-based trainings, the history of corporate power seminars and with CELDF, we teach Democracy School. 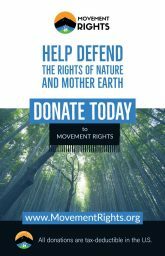 This program seeks to advance Rights of Nature as a framework for local, state, and international action as a solution to the growing market-driven environmental and climate crisis. 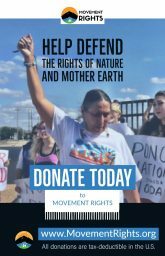 The growing movement for the rights of nature is about changing the way we treat nature in culture and in law by recognizing legal standing for ecosystems to exist, and regenerate their natural cycles—a necessary part of placing our human laws and actions in alignment with Nature’s laws. We bring our global allies together to deepen our shared analysis as well as tackle traditional issue-based campaigns with new strategies for advancing rights-based ecosystem protections. We have held international symposia and summits, written books and reports, held press conferences and provided trainings. 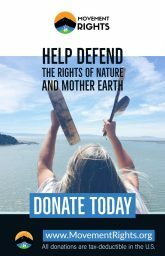 Our Executive Director is a founding member of the Global Alliance for the Rights of nature (GARN) and we are called upon to share our work in countries and communities around the world, at the United Nations and other forums. Living within the carrying capacity of the planet we call home requires that we adhere to the natural laws governing all life and does not extend human authority over them. Ancient and living Indigenous cultures that live in connection with land and have knowledge of its care, often called ‘Original Instructions’ have much to teach us about this world. Indigenous traditions tell us that all economic activity must be rooted in an understanding and respect of our sacred relationships with Mother Earth, and that our continued wellbeing depends upon it. 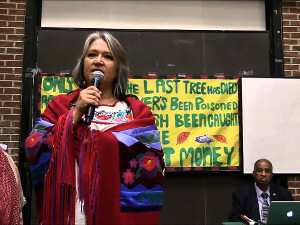 Led by co-founder Pennie Opal Plant, our Indigenous Connections program seeks to help advance the understanding and vital necessity of integrating Indigenous spiritual traditions as part of our work to transform culture, law and economies. We are working with our partners including the Indigenous Environmental Network (IEN) to bring Rights of Nature as a legal framework directly to Native communities in Turtle Island (US) in ways that help protect tribal lands. From leading healing walks through local refinery corridors with our partners Idle No More to learning seminars on traditional practices for land stewardship, we work to elevate the rights, voices and perspectives of Indigenous peoples worldwide to protect and share the lessons of customary ways that help all communities—Indigenous or not—become true caretakers of the places in which they live.